GBF is partnering with CurrentCast to share information that they develop with other partners about water stewardship and sustainability in the Great Lakes and surrounding watersheds. CurrentCast is a project of the Center for Transformative Action based at Cornell University. CurrentCast content is owned by ChavoBart Digital Media, Inc. The Atkinson Center for a Sustainable Future at Cornell University provides scientific content support and reviews all editorial idea for the initiative. Invasive mussels muscle their way into the Great Lakes…on this CurrentCast. You might think a creature the size of a dime is no match for a freshwater system the size of Texas, but quagga mussels are prolific breeders. Multiply one by trillions, and you get mussels that can wallop even a big body of water. Native to Eastern Europe, quaggas – like their cousins the zebra mussels - barged in through the ballast water discharged from ships, and were first spotted in Lake Erie in the late 80s. 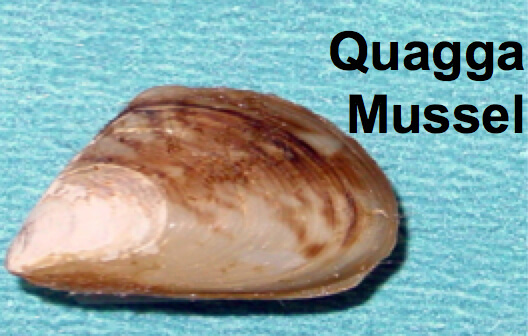 Quagga mussels feed year-round on plankton and other organisms, depleting food supplies for native fish which can create a devastating domino effect in the food web. So finding a way to knock out these invaders is critical to preserving a healthy Great Lakes ecosystem. CurrentCast is produced in partnership with Cornell’s Atkinson Center for a Sustainable Future. Learn more online at CurrentCast.org. GBF helps communities tackle invasive Phragmites. Learn more . Stopping Asian carp in the Great Lakes. Learn more . Round Goby. Short post from CurrentCast. Learn more . Top 6 invasives that threaten Great Lakes wetlands. An interview with ecologist Dr. Janice Gilbert. Learn more . General info on Invasive Species . Learn more . ← What’s up with Muck? Baby Beluga in the Deep Blue…River?